River’s Edge seems like a pretty nice place to lay one’s head for the night. For many of us living busy lives in big cities, the opportunities to shut off and escape into nature can be far and few between. It’s why I whenever I’m able, I take off to the countryside, both at home and abroad. The rolling green hills of New Zealand’s North Island seem like the perfect place to relax for a night. 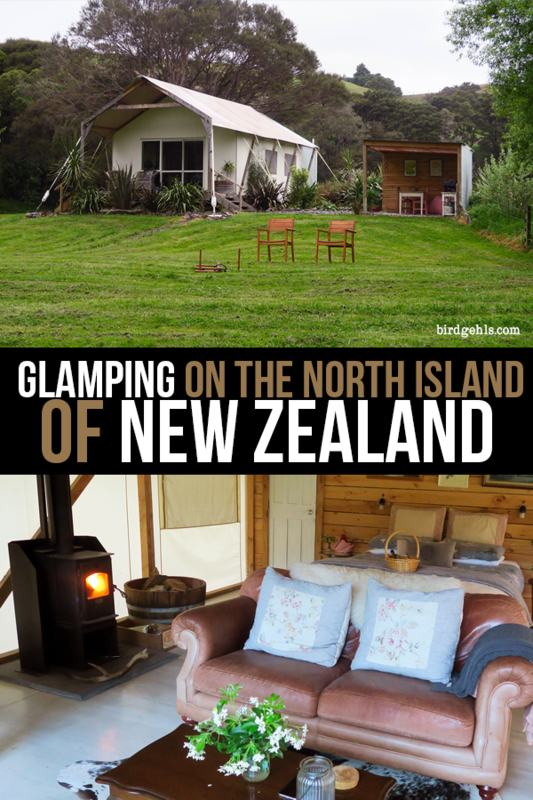 I love a good glamp (that’s glamour camping, for the uninitiated) and so in trip planning for our road trip around the North Island, began looking for a suitable place to camp out for a night or more. 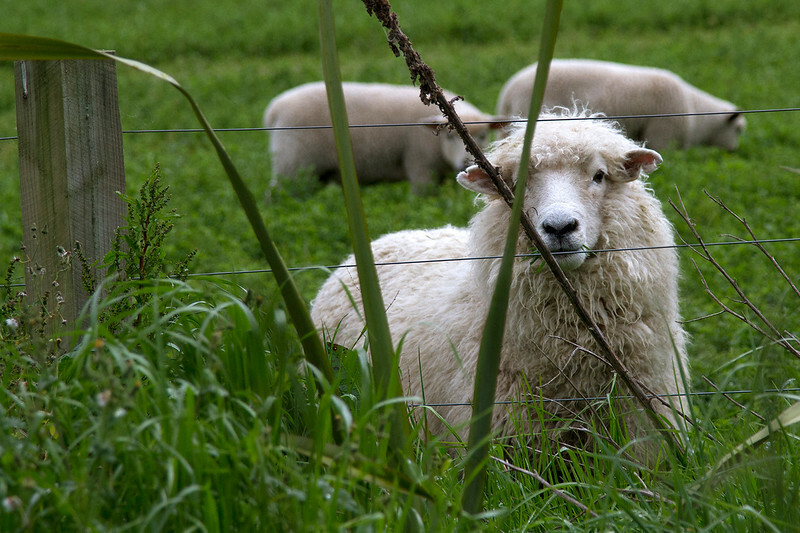 What are ewe lookin’ at? It’s a splendid idea, really. Farmers or those with properties derive extra income and city folk get to spend a night or two experiencing the pleasures of the countryside. Win, win. In fact, having done the same thing very recently with Shacky in Australia, I was keen to give the experience another go. There were two factors that needed consideration. 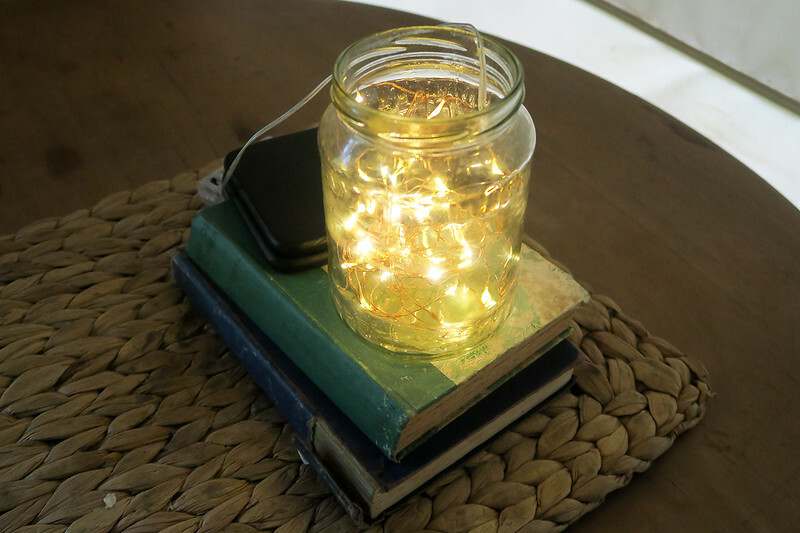 Fairy lights are always a nice touch. The first was that the glamping tent or house in question was available and worked with our dates. 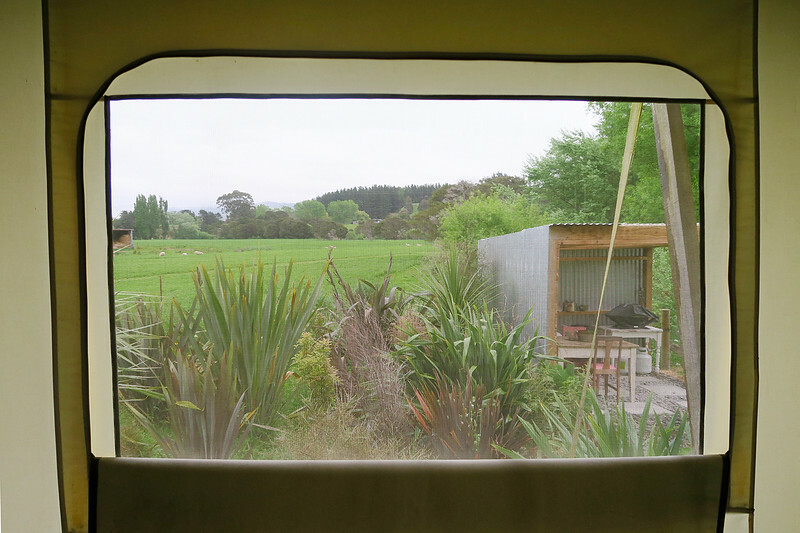 This was sadly the reason why I didn’t end up booking this little hobbit house not far from Auckland. 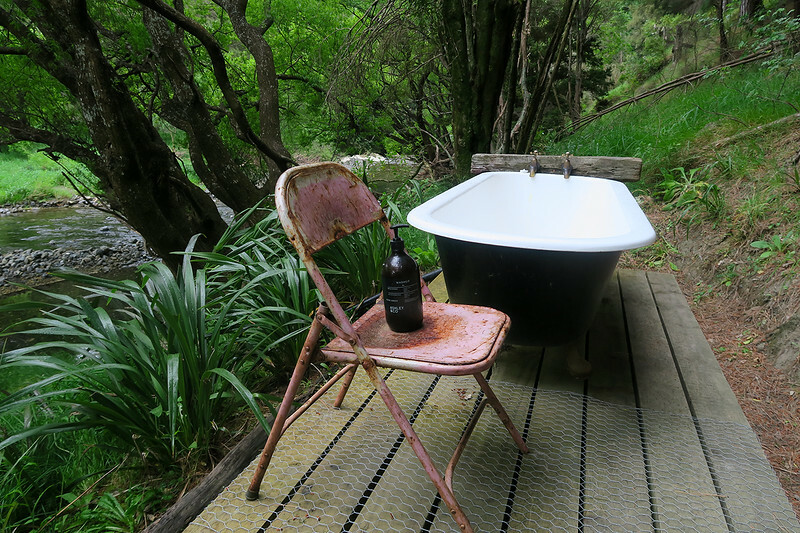 It had to have an outdoor bathtub as well. I simply wouldn’t settle for anything else. I do not have a bathtub in my current flat and it’s a fact that haunts me every day. 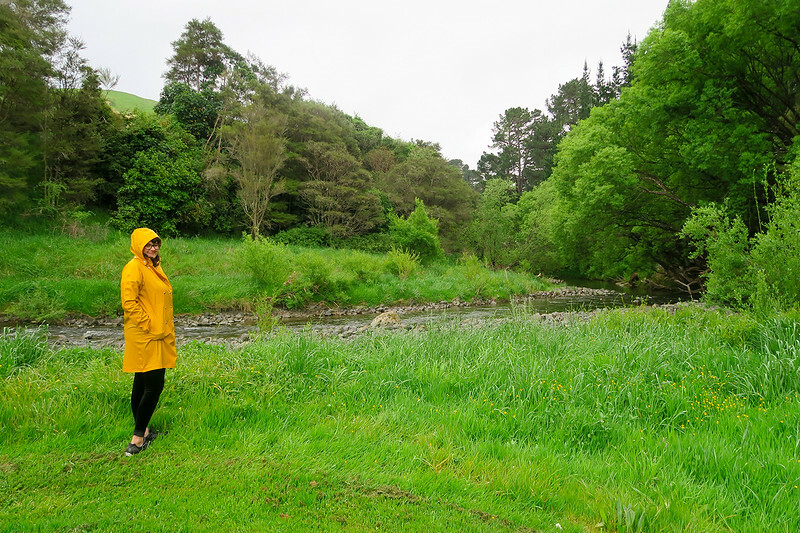 Ultimately, we settled on River’s Edge, not far from the town of Martinborough, in the North Island’s south (that was a strange phrase to write). Do you need to rent a car for your New Zealand road trip? Compare rental car prices here. Inside River’s Edge – cosy to the max. 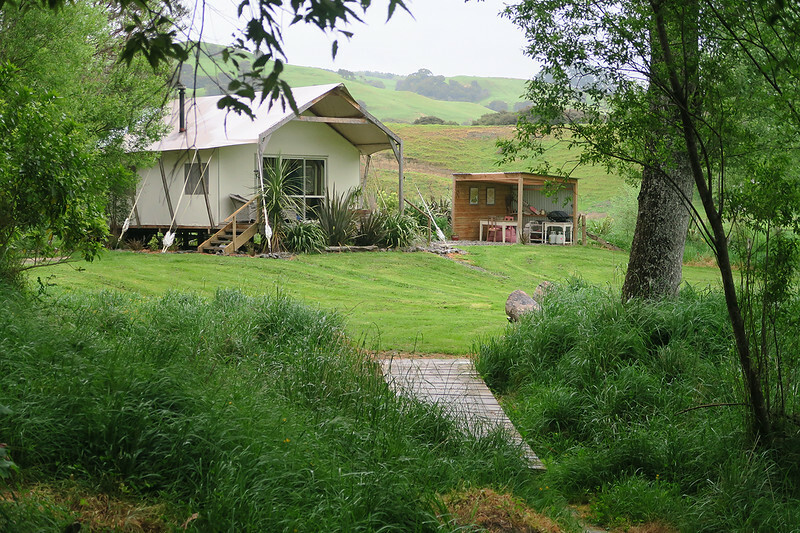 River’s Edge consists of a glamping tent with a self-contained kitchen and bathroom. 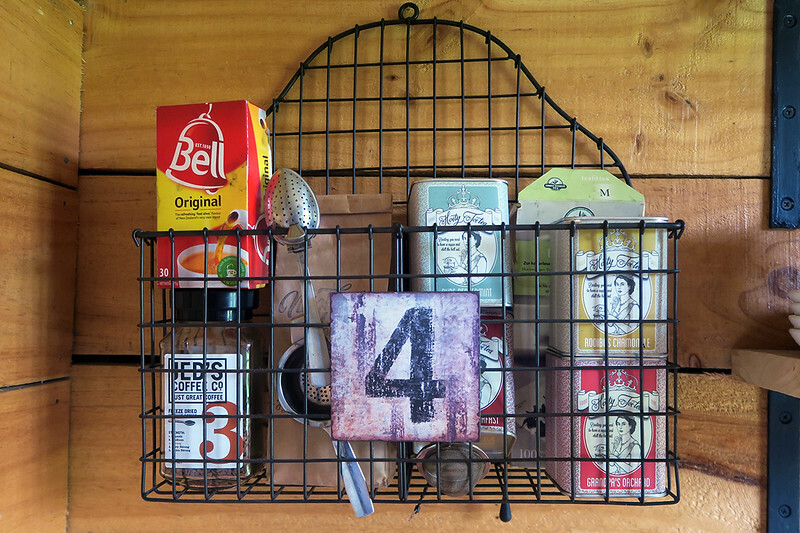 The kitchen inside the tent is for washing up and storage purposes only, but there’s an outdoor area in which you can cook any food you bring along with you. 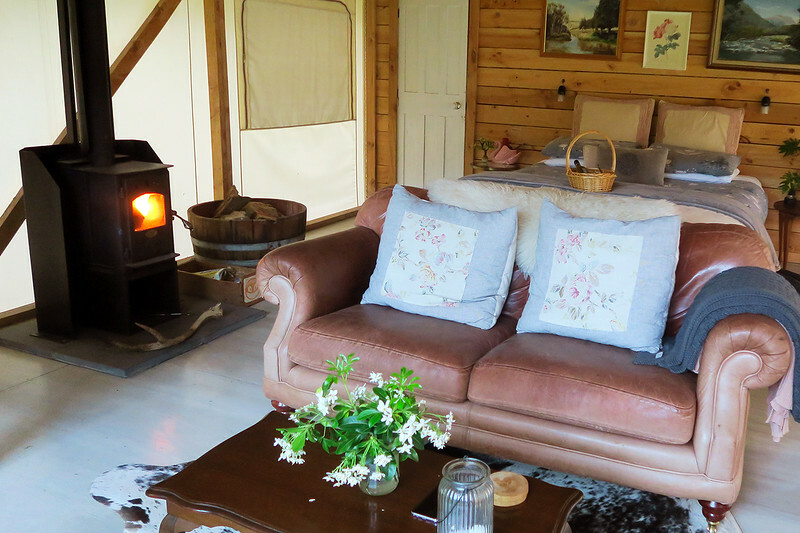 It’s the perfect size for singles and couples looking to spend a couple of night’s kip away from civilisation. The view from inside the tent. There’s a river running nearby (hence the name) and a bunch of sheep milling in the paddock behind the tent. They’re curious little things – I had a good time baa-ing in their direction, which led to many startled looks from them. Plenty of chairs align the river should you want to relax and take in the sights. 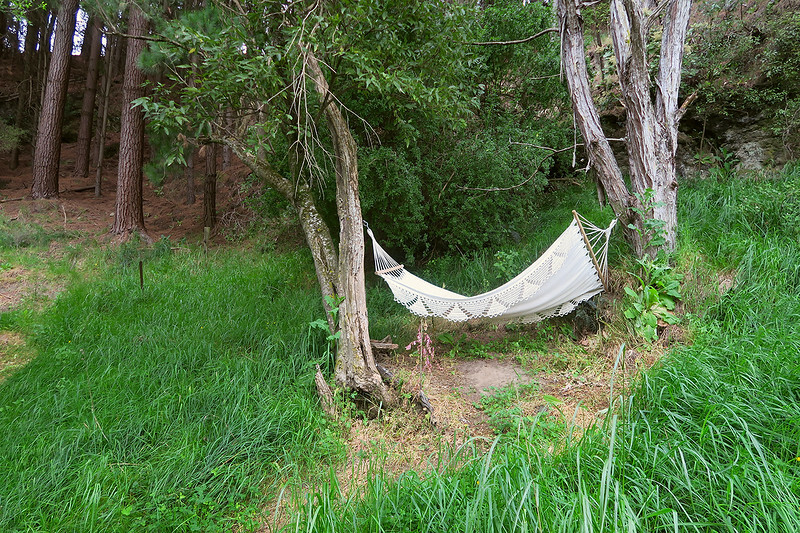 There’s a pretty sturdy hammock a short stroll from the tent as well, which is fun to laze around in. I wish this was my everyday. And the bathtub! Oh, the glorious, glorious bathtub. This is without a doubt my favourite feature of the place, all I dreamed of and more. Walking back after a good soak. The place is very cosy! 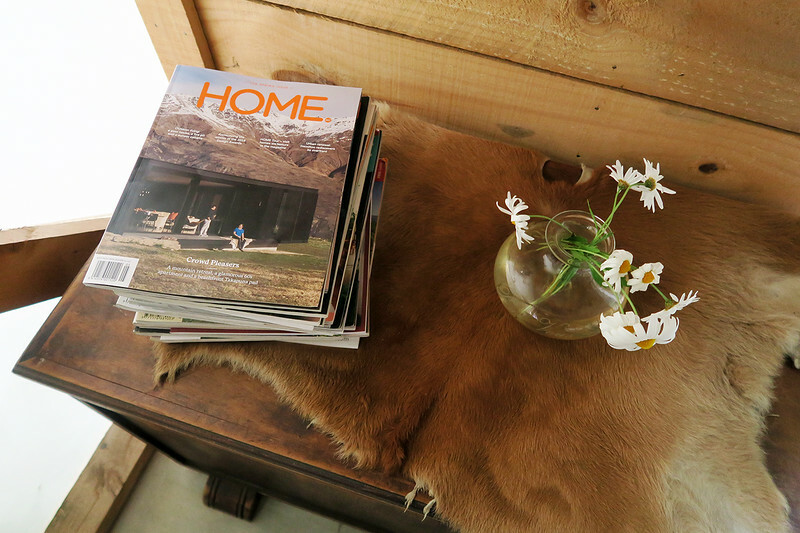 I like the decor inside very much – it’s what I always envision for my house, but never manage to achieve. I really like the fact that there were a couple of treats awaiting our arrival – it made for a nice surprise! 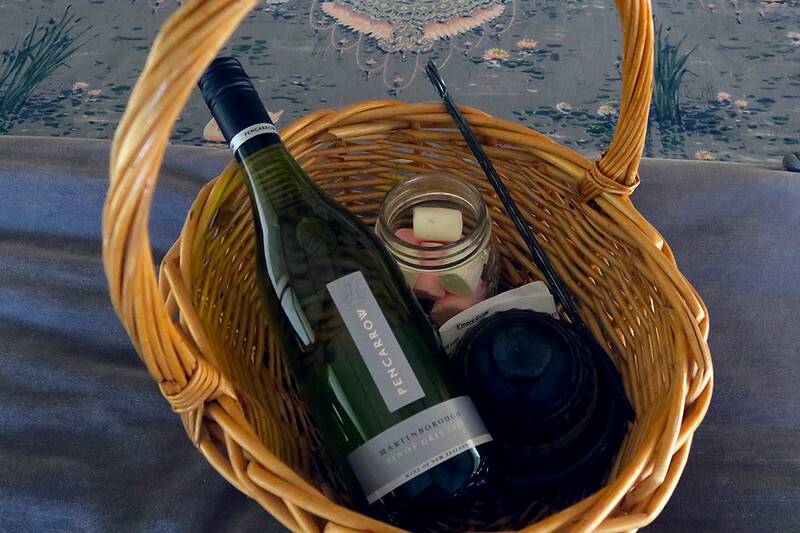 In a basket on the bed sat a bottle of local white wine and the ingredients for making s’mores, along with instructions. We thoroughly enjoyed roasting the s’mores by the fire (making a right old mess) and sipping on a glass of vino whilst the world around us darkened. I’m not normally a white wine drinker but this is really nice. There is plenty of tea on hand, which is pleasing for someone like me who has a rampant addiction to the stuff. Cooking dinner caused no fuss either, the BBQ outside worked perfectly fine. The stove kept the place quite snug and it was lovely to fall asleep to the gentle baa-ing of the nearby sheep. Best of all, it was peaceful. No traffic, no people, just us and nature, which is exactly what we were after. So glad I brought my trusty raincoat! Typically, we had perfect weather in NZ up until this point, when the heavens opened and a deluge poured down. It was pretty soggy for the remainder of our night there, which is a shame. 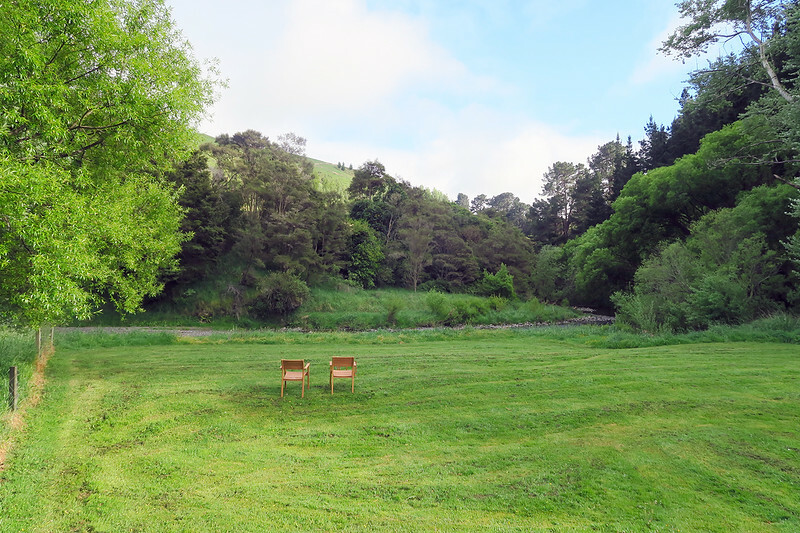 I would have liked to have sat by the river with a glass of wine, or played more of the ring toss game that was sat on the front lawn. The bath stuff provided is all locally made, shame about the plastic though. 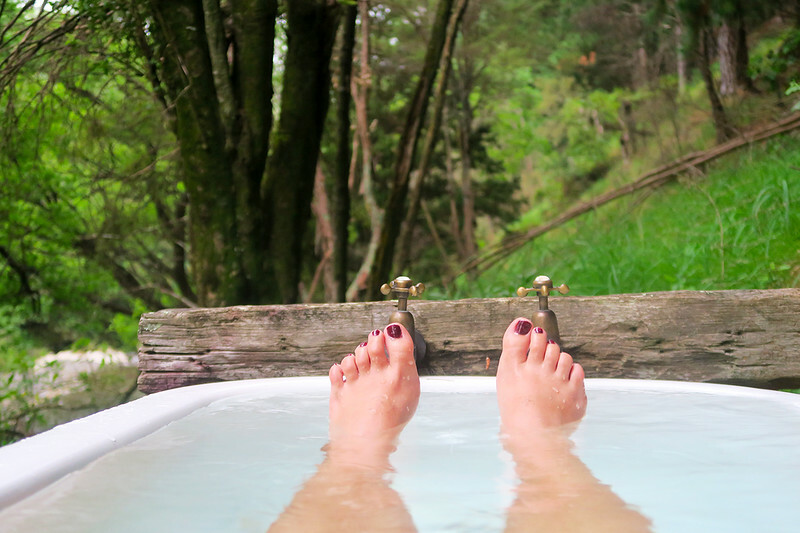 The rain did not deter me from having not one, but two baths however – one in the evening and another in the morning. I figured I was going to get wet anyway, so what did it really matter? It was nice sitting in the warm water, feeling the cool drops of rain hitting my skin and listening to the sound of the river running nearby. Getting down to the tent itself was a bit of a challenge – the descent was steep and gravelly and we were a bit worried about damaging the rental car. We made it okay, but it was best taken slowly. The only other issue was the lack of light once the sun went down! Some of the solar lights weren’t charged and the lights inside weren’t really bright enough, which made reading after dark a bit of a challenge. We drove to River’s Edge straight from Taupo, with an out of the way yet necessary detour to the art deco town of Napier on the island’s east coast. It ended up being around an eight hour journey from Taupo to River’s Edge. It’s not an easy trip either – the road from Taupo to Napier in particular is pretty twisty and hideous. I think we may have benefitted from breaking up the journey and staying somewhere in between Taupo and Martinborough (or skipping Napier entirely). It would’ve been less of a rush to get to our glamping destination on time. Should you use Canopy Camping NZ? Yes! From an organisational point, the experience is flawless. 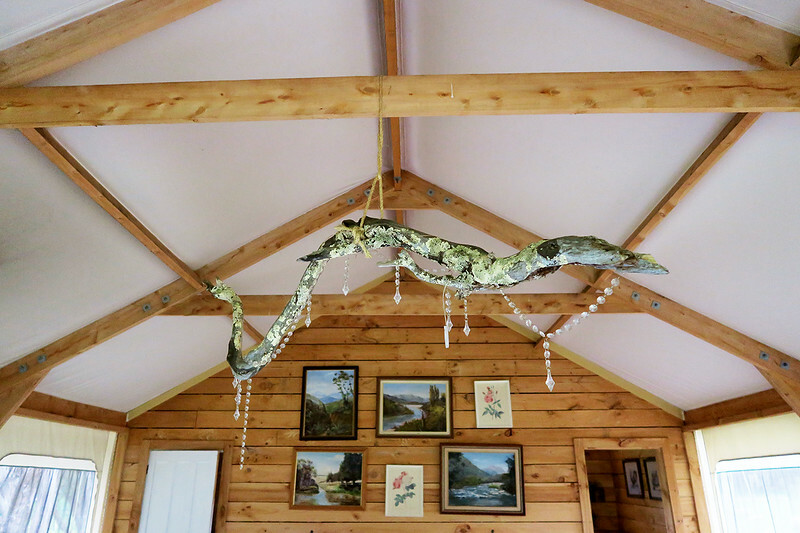 You only have to pay a deposit during the booking process, which is a nice change from many other glamping organisations, which require payment upfront. Full payment is still required a month out from your arrival, which I think is pretty reasonable. You’re sent a pre-arrival email five days in advance, which features specific information about your stay, such as the exact address. 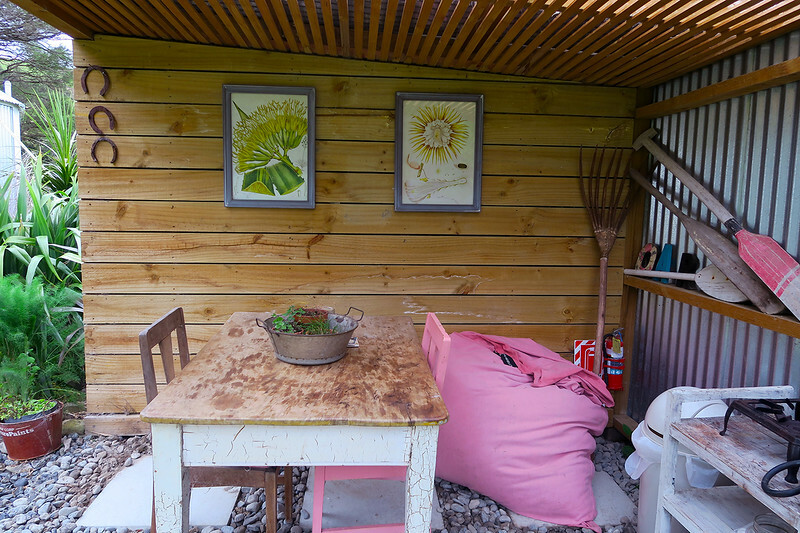 I can’t speak for all of the hosts, but ours was extremely thorough and helpful, sending detailed emails and leaving easy to follow instructions on how to reach the property, as well as how everything worked within the glamping tent. More details inside River’s Edge. As always, I wish we’d given ourselves a bit more time. We arrived around 5pm, but check in opened a couple of hours beforehand. However, we were working with time constraints and there wasn’t much we could do in this regard. Although our host had an extra option to provide food onsite, we had a budget we were keeping to (NZ is expensive, yo) and opted to bring our own food. A quick shop at Pak’nSave did the trick. We were able to cook all the food using everything provided. Could spend a few hours lazing around here, easy. I do also wish we’d had more time to check out the local area. We did manage to squeeze a couple of things in on our way to Wellington, but it was a bit of a rush. Poor planning on my part, but then it was worth spending an extra day in Taupo, so I’m not too upset. Of course there were blue skies the next morning. There were plenty of pamphlets on hand in the tent, showcasing culinary sights of the area. However, I keep an eye out for the weirder sights of a region and Wairarapa didn’t disappoint. 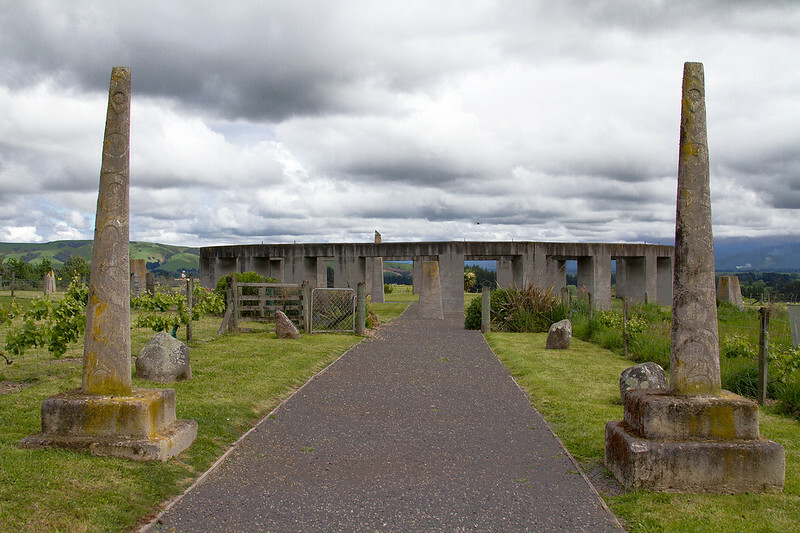 I was very excited to visit New Zealand’s version of Stonehenge and it didn’t disappoint. The UK is pretty much as far away from NZ as you can get, so members of the Phoenix Astronomical Society decided they’d build their own henge, which they completed in 2005. It’s not an exact replica of the famous Salisbury henge, as much of its starlore is inspired by Polynesian and Maori traditions. It’s a lot of fun to check out and I highly recommend stopping there, if you’re ever in the area. This is one creepy looking house. Right across the road is a super creepy mansion known as the ‘Ahiaruhe Abandoned House’. It’s become a local legend, with many being sure it has a tragic history and is haunted by the ghost of a woman killed within it many years ago. Others believe it’s built on the remains of an old Maori village, with the ancestor’s spirits visiting at night. 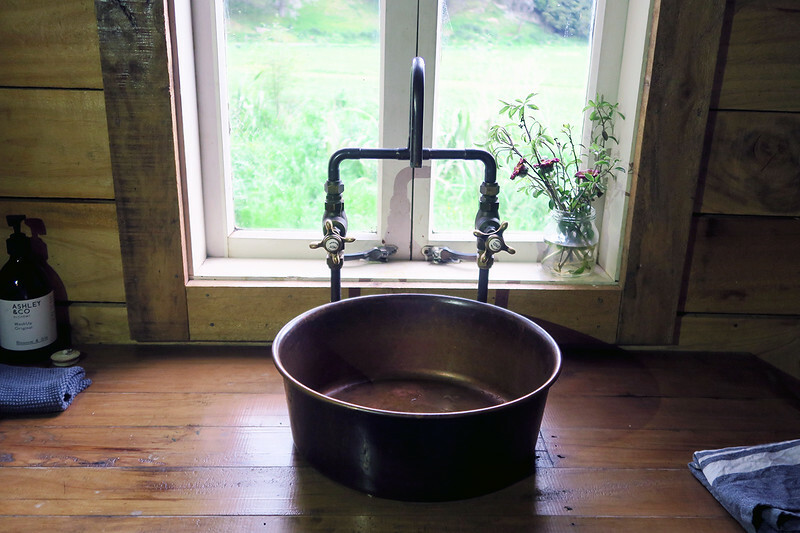 Rather, the house belonged to a Doctor Forrest, who arrived in New Zealand from Scotland in 1911 and constructed the house in 1925 in Palmerston North. It was owned by two more doctors who used it as surgeries until 1972, then as the setting for a law firm. 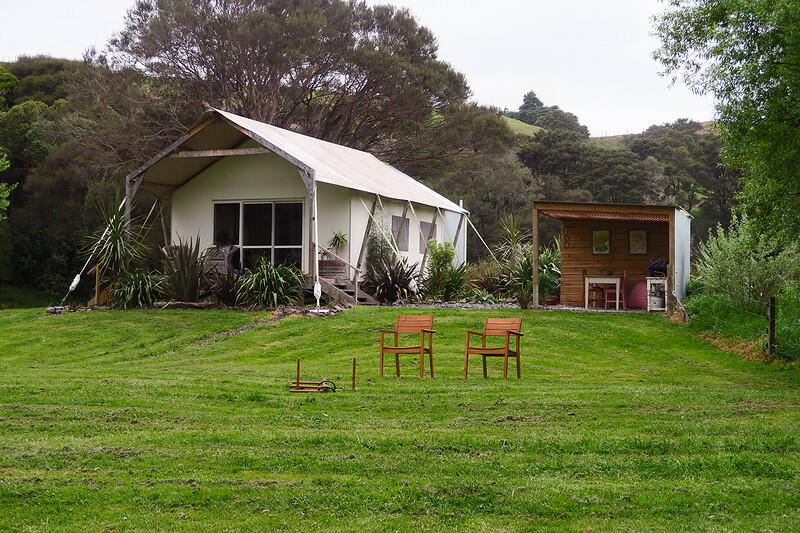 In 1986, it was moved to Ahiaruhe by a local farmer, who shifted it in two pieces. However, family difficulties led to the house being left abandoned. 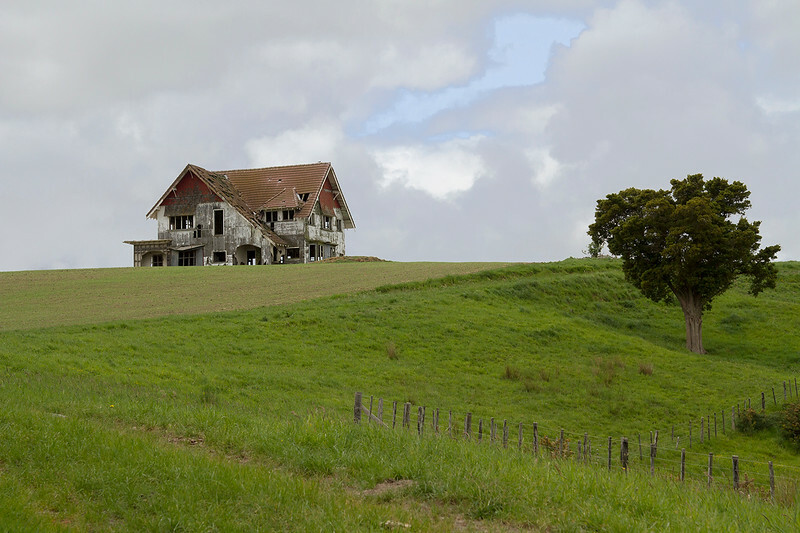 It sits there now on this hill, open to all the elements and is probably the most photographed house in New Zealand… for good reason! How cute is this pub?! 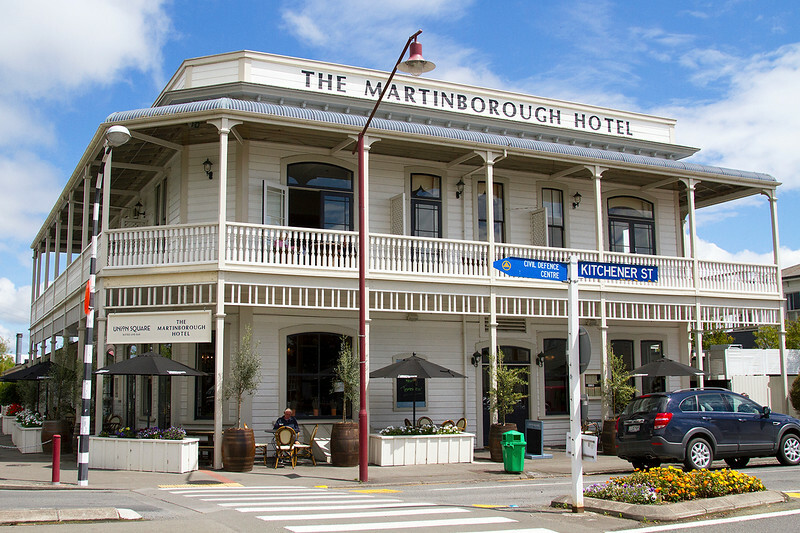 I do thoroughly recommend checking out the nearby town of Martinborough. It’s small, but has some really beautiful buildings and cute boutique stores to shop in. I wish we’d had more time to poke around it, but we were on a mission to get to Wellington. Fun fact – it’s the headquarters of one of my favourite brands, Thunderpants! As a sustainability nut, I travel everywhere with them. See my other posts about New Zealand travel here. I also have, ahem, a whole section on my website dedicated to glampsites around the world, if you’re interested. 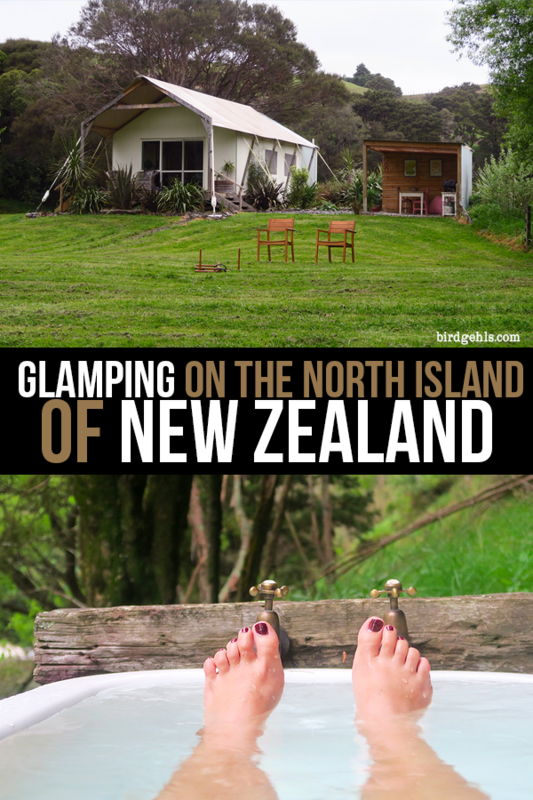 Have you been glamping in NZ? Would you like to? I’m still determined to come back and stay in that hobbit hole.